Posted On August 07, 2015 by Team iCynosure. A mobile today is no longer a means of communication; it has become a way of life for most people. With the evolution of a calling and texting device to an avenue for reaching out to the world through the internet and through the apps. Being in the social media industry, a mobile is nothing short of a miracle for us who want to stay connected to every piece of information that makes that one ounce of difference. Not only for me but I see being connected as such an important part of life today across generations and hence the two things that are most crucial for this are a great mobile phone and super network. The most important aspect of a network that determines its quality is the speed with which it allows users to stream, browse and perform multiple functions on the very same device. Every time we lose a few precious seconds because of connectivity, speed and range issues, we want to take out Aladdin’s lamp and pray for a miracle. This has troubled a lot of people and thus the folks at Airtel India, put all the might behind the project, brought in the forces and have now offered us the fastest network ever, the #Airtel4G. 4G has been launched by Airtel in 296 towns across India to offer high-speed data services at unimaginable speed. So has this made you interested enough, curious enough to try it? Then the first thing you need to do is get a #GetAirtel4G sim card for your 4G compatible mobile handset. And the clincher is that you need not even step out of your home for the upgraded Sim card…. 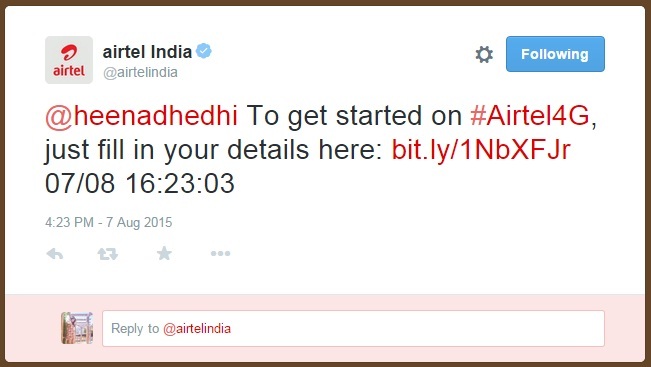 All you need to do is tweet #GetAirtel4G to @airtelindia, fill in your details in the provided link and stay put. You will receive your 4G Sim card delivered to your home for free within 4 hours. So what are you waiting for? Head straight to twitter, tweet to them and upgrade your internet experience with Airtel4G. Get 4G Ready, now. I hope they turn out to be good after being in the market for a few months, Airtel 3G is bad at my place in Haryana.